A duathlon is a run-bike-run event that offers a good way to join the multisport movement. These typically range in distance from a 2-mile run, a 10-mile bike and a 2-mile run to a 6.3-mile run, a 37.3-mile bike and a 6.3-mile run. These events often are combined with triathlon races in the United States, sharing the same course and transition area. Duathlon popularity has been steadily growing since the 1980s. If you plan to join this multisport movement, several tips could help you during your first race. Budget at least 12 weeks to train for your duathlon. You need a good level of basic fitness before you begin on a training schedule. For example, if the race you choose features two 3-mile runs and a 20-mile bike ride, be sure you can run for 30 minutes without a break and bike for 45 minutes at a comfortable pace before embarking on a training program. This will help you avoid overtraining, which can sap your motivation, disturb your sleep, weaken your immune system, lead to feelings of depression and raise your risk for injury. Utilize bricks when you train. This means you do a bike and run in the same workout. For example, do a short bike ride followed immediately by a short run, such as a 6-mile ride with a 1-mile run. Work up to doing three to four short bike-run segments in a row, recommends triathlete and ACE certified personal trainer Enrico Contolini in the BeginnerTriathlete.com article, "Introduction to Bricks." Set up a mock transition area when you do your brick training and also practice a smooth transition from biking to running. For example, practice dismounting your bike efficiently and changing from bike shoes to running shoes quickly. No matter how much brick training you do, you are likely to experience a feeling of rubber legs or running like a penguin after your bike-to-run transition. 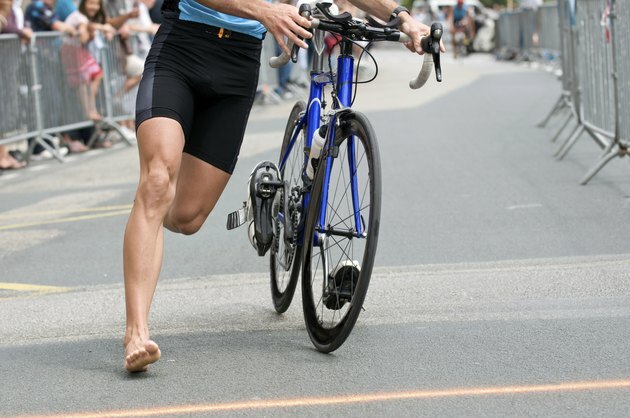 Put your bike in a low gear and spin your pedals quickly for the last few minutes of the cycling leg to help minimize this sensation, advises "Cross Training" author Gordon Bakoulis Bloch, an elite national-class runner and fitness author. If you are new to running, also consider walking briskly for about 100 yards before you start running in the final run leg. Also choose a lower gear than you plan to use during the main portion of your race when you start out on your bike to minimize lactic acid accumulation. Practice your transitions. These are part of the race and count in your overall time. Also have a plan for your setup. For example, if you like to put your helmet on prior to your sunglasses, arrange your gear accordingly. If you are changing shoes, set up the shoes so you can slip them only quickly. Practice removing your running shoes and placing them in an easy-to-access spot for when you return from the bike ride. Also consider removing your feet from your shoes before you dismount your bike, but only if you are using clipless pedals.